From pushing, to pedaling, to rocking, Kaplan offers something for all developmental levels to enjoy. Products such as trikes, wagons, and wheelbarrows can be used indoors or out. 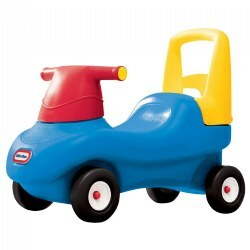 While push along items, wheely toys, and corn poppers are a great addition to your gross motor area. 12 - 24 months. 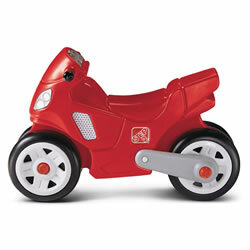 Made of tough plastic, this ride-on teaches young ones about balance in complete safety. With its low sitting position and high back, it offers the same support as a chair. Color may vary. 9 - 36 months. 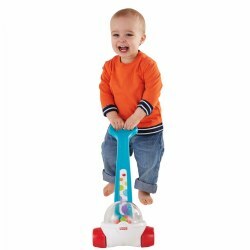 This combination ride-on/push toy encourages coordination and balance for little ones while promoting motor skills and muscle development. This super-stable racer has a low seat, high spoiler, tall back, and sturdy, easy-grip handlebar for a secure, steady ride. Durable plastic construction. Assembly required. Measures 22"L x 10"W x 17"H.
18 months - 5 years. This classic kid powered car has a whole new look. 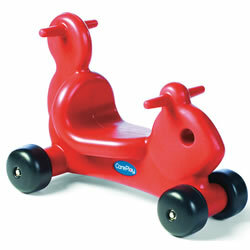 New features include removable floor and a handle on the back for parent controlled push rides. Designed with a comfortable high seat back with cup-holders and storage in the rear. Includes special features like an "ignition switch" and an open-and-close gas cap. Rolls on rugged, durable tires and front wheels spin 360 degrees. Weight limit up to 50 lbs. Assembly required. Measures 29.5"L x 16.5"W x 33.5"H. Made in the USA. 12 months - 3 years. Encourage little ones to keep moving with exciting ball popping action and sound! Brightly colored balls pop around inside the clear dome as baby pushes it along. 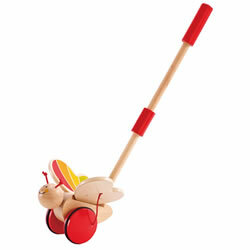 Sturdy base with easy-to-grasp handle helps steady new walkers. 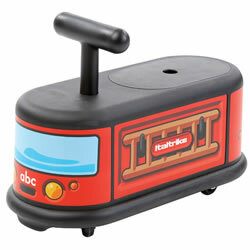 Entertains children and encourages both walking and visual tracking. 3 years & up. This car's sleek, innovative design allows this car to go with no gears, batteries or pedals. Just steer and away you go. Patented safety seat design places rider in a safe, comfortable position and minimizes tipping. Use indoors or out on a smooth, flat surface. Supports up to 220 lbs. 1 year & up. 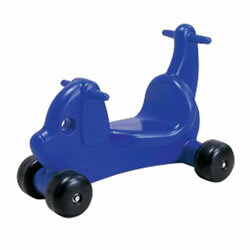 A rocking horse with contemporary style! 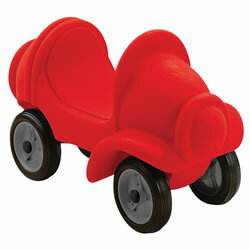 This fun bright rocking horse will liven up any bedroom or playroom. Horse is smoothly rounded with a high back seat. Features easy-grip handles, low saddle for stability, and comes fully assembled. Weight limit 50 lbs. Made in the USA. 18 months - 5 years. 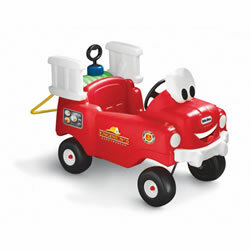 Little firefighters will ride to the rescue in this fire truck with water tank and a hose that really works! 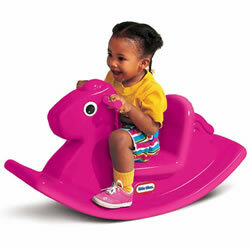 Foot to floor ride on holds up to 2 gallons for outdoor water play. 16" x 28"W x 15"H.
18 months - 5 years. 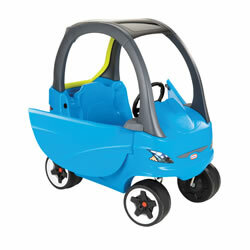 Children will love taking a ride in the stylish Cozy Coupe® Sport! 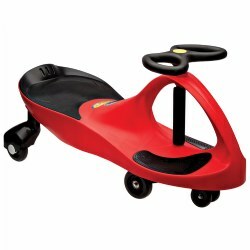 Features a handle on the back for adult-controlled rides, and a removable floor for when a child is ready to get moving independently. 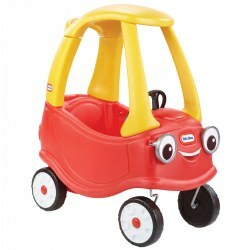 Designed with a high seat back, storage in the rear, ignition switch, moon roof, working horn, and durable, quiet ride tires. Front wheels spin 360 degrees. Weight limit up to 50 lbs. Easy assembly with no tools required. Measures 33"L x 19.5"W x 39"H. Made in the USA. 1 - 3 years. Puppy has handles on his tail so toddlers can push, new walkers have a handy grip. Heavy-duty wheels. 23"L x 17 1/2"W x 13"H.
19 months & up. 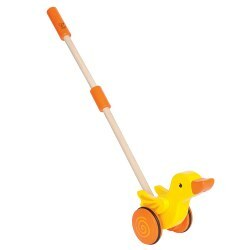 Not only are these pull toys fun to watch, but they stimulate manual dexterity and hand eye coordination. 12 months - 3 years. 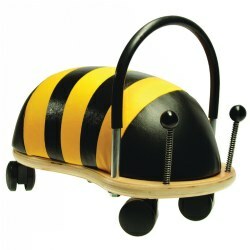 This cheery Ride 'n" Roll Bee is not only a delightful ride-on toy, it also helps in developing coordination, motor skills, and balance. Features such as multi-directional castor wheels, an ergonomic handle, and memory foam seat promotes independence along with rolling good fun! Measures 8" x 8.5" x 14.5". 18 months & up. 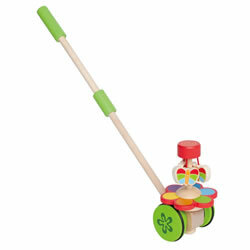 Engage little walkers with this spinning, flapping, twisting trio! Beautiful wood designs and bright colors capture interest as little ones build coordination. 18" - 22" tall. 18 months - 3 years. The distinctive shape makes this Bee very user friendly! With a bright, friendly design, children can go backwards, forwards, sideways, and round and round. This Bee helps promote gross motor skills and balance and has a padded layer of sponge which is covered with a tough layer of polyurethane leatheroid. Wipes clean easily. 8 ? "H (seat height) x 15"L x 9"W.
3 years & up. 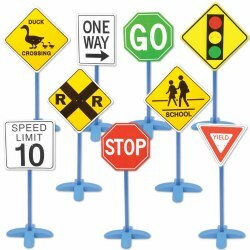 Your little one can learn to navigate the roads safely with these traffic signs! These road signs are designed with lightweight, durable plastic and are easy to assemble, making them the perfect addition to any roadway! Stop sign measures approximately 27 1/2" tall. 18 months - 3 years. 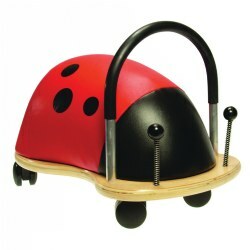 The distinctive shape makes this Lady Bug very user friendly! With a bright, friendly design, children can go backwards, forwards, sideways, and round and round. This Lady Bug helps promote gross motor skills and balance and has a padded layer of sponge which is covered with a tough layer of polyurethane leatheroid. Wipes clean easily. 8 ? "H (seat height) x 15"L x 9"W.
18 months & up. 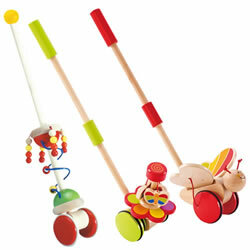 Engage little walkers with this spinning, flapping, twisting trio! Beautiful wood designs and bright colors capture interest as little ones build coordination. 18" tall. 12 months & up. A gentle push or pull starts the duck wings flapping as it ties to take flight. 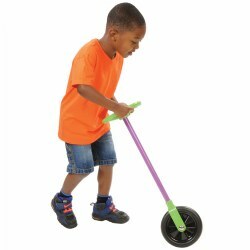 This colorful version of the classic push toy will give hours of fun providing exercise while developing coordination, balance and motor skills. The solid wood construction comes from sustainable materials with a child safe paint. 18 months & up. 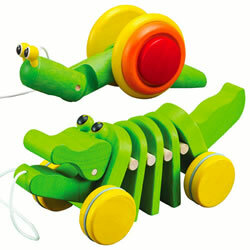 Engage little walkers with this spinning, flapping, twisting trio! Beautiful wood designs and bright colors capture interest as little ones build coordination. 22" tall. 18 months & up. 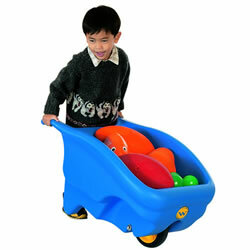 Children will love pushing around this one wheel wheelbarrow. This wheel barrow is easy to clean. very stable, stackable, and has no sharp corners. Ultra strong and highly shock-resistant. The single wheel is designed for exercises that develop balancing skills. 1 - 3 years. 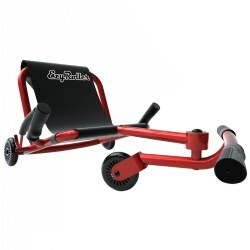 Uniquely designed and durable enough to hold up to 110 pounds, this Italtrike La Cosa Ride-on toy is perfect for indoor or outdoor use. Front wheels turn 360 degrees for easy maneuverability. Rubber, non-marking wheels, storage compartment under seat, and one-step assembly. Nesting design allows vehicles to stack 4 high for easy storage. 3 years & up. This little bike is perfect for active toddlers. Realistic looking headlights and taillights. Easy grip handles for little hands. Some assembly required. 15 1/2" x 23 1/2" x 11".